Professional services practitioners who are involved in process improvements will likely be familiar with Six Sigma (6σ) and the 6σ tool called the Kano Model. It is certainly not a tool used by marketing departments, but perhaps it should be. The Kano Model can provide a needed perspective for professional services marketing strategy, helping both subject matter expert and marketer understand where to focus content development. The Kano model, developed by Professor Noriaki Kano in the 1980s, is a theory of client requirements and preferences used to enhance product development. The model classifies requirements from "must haves" to "delighters" so that the product developer accounts for these in their new product releases. There are five categories used in traditional Kano modeling, and for those who are interested, a good tutorial on the Kano Model can be found here. However, for content development purposes, understanding the three primary preference categories, 1) must have/basics, 2) core competency performance (sometimes noted as "more is better"), and 3) delighters, will help marketers, business developers, and practitioners focus on the salient: your value-add and competitive differentiators. That which the prospective client will find compelling. As you might expect, must have or basics are those features that must be present for the product or service to be acceptable. Absent these features, the service would be considered not fit for purpose or subpar at best. Must haves include, for example, the practitioner having the required license (such as an attorney being a member of the bar in good standing) or possessing the necessary knowledge of the service offered. Beyond such right-to-play requirements are those basics a prospective client will expect: e.g., the professional will act in the client's best interest, understand what is required to affect a positive outcome, and possess the substantive expertise necessary to do so. These sorts of things are the basics. They are the minimum. Yet, so many emblazon their websites and marketing material with "personalized service!" or statements noting that their professionals possess requisite competency and subject matter expertise: "our accounting staff are expert in...," "we have combined experience of...." These are offered as distinguishing features, yet they are only must have/basics at best. The most important takeaway is that these attributes never increase client satisfaction. These basic service elements and the expertise of your practitioners are required. They do not add value. They can only detract from client satisfaction or disqualify participation if not expertly delivered. With marketing content focused on the basics what do you expect the impact to be? Do you anticipate that prospective clients will pay a premium? Note the trajectory of the arrow in the Kano Model. In terms of your services, they are the product equivalent of commodity. Core competencies (often labeled more is better) are the attributes that must be met for the client to be merely satisfied. And while more is indeed often better, it does not necessarily increase client satisfaction as these features are taken for granted. (Compounding this is the fact that the client may not be able to distinguish great from good from fair.) Because of this, execution of core competency can only detract from client satisfaction if not done well. Even when exceptionally well done, the service will have only met expectations. Most professional service marketing spends too much time here also: "award winning...," "we are ranked number...," "best place to...," and so on. It is not to say that these things aren't worthwhile, but they are often only footnotes, asides, and tick boxes. They are not likely to be the winning advantage or command premium. The takeaway here is that while core competencies, perhaps (and only perhaps) rise above "commodity" in value, focusing content here will not sufficiently distinguish the firm or its services. It is also important to consider that while continual enhancement of performance is requisite, performance that may have exceeded expectation once, will only merely satisfy the next time as once delivered it becomes expectation. It is the tyranny of the downward pressure over time as denoted in the Kano Model. These are the attributes of a service that truly delight, even surprise the client. In fact the individual client, or the marketplace at large, might not even know these service concepts existed until you delivered them. Your client did not know they needed or wanted them. Here is the salient in terms of marketing. The wow factor. The truly innovative providers – those that not only capture market share, but create new markets and command premiums, focus there efforts and marketing here. Part of Kano's theory is that prospective clients can only partially tell us what is important to them. They simply do not know, in full, what is available or what they need. This is as true for professional services as it is for products. As such the Kano Model is an excellent tool, not only for marketing departments, but business developers, and identifying go-to-market strategies. (Hint: benchmarking other providers in your market won't help.) These models can be developed for markets, verticals, targeted accounts, individual business units, even against client profiles allowing for highly targeted and effective marketing and sales campaigns. The wow factor attributes of your services need to be the focus of content marketing – particularly in professional services marketing – and woven into the fabric of thought leadership and client communications. Focus on: What are your firm's or practice groups' wow factors? How will you continue to innovate to keep ahead of those downward pressures and communicate your continuous innovations to the market? 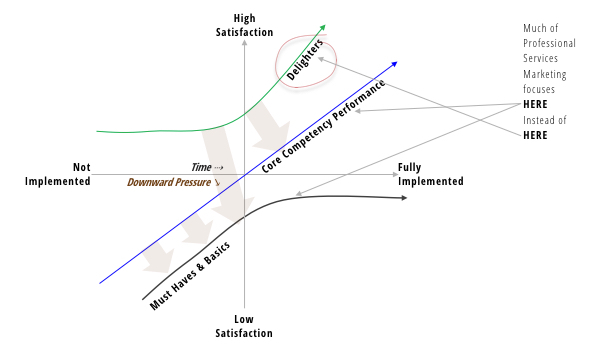 As with products, services too are subject to the same downward pressure expressed by the Kano Model. Over time, those things that were once delighters become expected competencies and even basics or must haves over time. For this reason marketing content rarely has the longevity of excellent thought leadership, and content needs to be continuously updated to focus on the new delighters. It must also demonstrate that core competencies are absolutely state-of-the-art. Case Studies that include client description of your firm's delivery of "wow factor" services are an effective vehicle for this.